This is the fifth (and second-to-last) of an ongoing series. This playlist was created by one of our esteemed curators, Decoder Magazine. They have been tirelessly uploading and sharing music from their growing collection all year, and we are the richer for it! It is a small sampler of what Decoder uploaded in 2015 -- featuring a particularly heavy dose of ambient and experimental tracks from the wonderful Power Moves catalog (affiliated with Decoder), as well as beats, vaporwave, and more. Decoder (which describes itself on twitter as "music from under a rock") and Power Moves (whose tagline is "true bedroom recordings with delusions of grandeur") aren't exactly new to the Creative Commons scene, but their contributions to the FMA, including PC Noise x Pedicure Records Vol 1 and Music of the Now Age, were welcome distractions from reality! So, here it is: the Decoder highlights selection from 2015! Listen or download in our handy sidebar player to the right, or see the playlist page for more. The folks behind Decoder Magazine have been faithfully sending out sonic signals into the music blogosphere for some time under their Crash Symbols label and former blog Get Off The Coast. With a successful kickstarter behind them and a print edition on the way, we're excited to welcome them as one of our newest curators. "Decoder Magazine is a print and web based chronicle of new music and events, also playing host to diverse multimedia projects that include an ongoing comic series... With so much of music being produced outside of traditional networks and communities, the obligation to seek out new and useful mutations has never been greater... We are not concerned about premiering or covering music in a way that props up vacuous marketing narratives constructed by publicists. In the same vein, our true vocation is the work we do to knit the musicians we cover into sympathetic digital communities in order to encourage new niches and growth along non-geographical lines." They'll be digging out and serving the freshest Creative Commons sounds with a focus on the blurred lines between Pop, Experimental, and Electronic music. They've already got quite a collection going on the FMA, but I've embedded their first contribution at right; a double cassette mixtape that collects tracks from all the diverse partisans of Living Room Visions, running the gamut from oblique sound collages to hyper melodic pop. You can check out their curator portal here. Living Room Visions is a prolific, international multimedia arts collective that holds its meetings on facebook, uniting a disparate network of home experimenters and fringe composers from Johnstown, Pennsylvania to Spain's blandly contested exclave Melilla on the coast of Morocco. Through a series of associated and equally prolific imprints, the group makes itself known. Having already said prolific twice, I hesitate to say it again, but these labels are prolific. The group's most active imprint is Sunup Recordings, who've loaded themselves down with what must be hundreds of releases in almost no time - check out their bandcamp if you don't believe me. Others, like Ailanthus Recordings, operate on only slightly smaller scales. The more recently founded Illuminated Paths can still go either way. Regardless of the volume of their output, these imprints distinguish themselves in that the boundary between personal art project and "entrepreneurial project" is invisible. These projects enshrine the utopic vision of one of the most fegund group of idealists we've ever known and they've been a pleasure to cover this last year via Decoder, particularly since the highly successful release of their first entirely collaborative effort, a double cassette mixtape that collects tracks from all the diverse partisans of Living Room Visions, running the gamut from oblique sound collages to hyper melodic pop. We couldn't be happier to have made it our first contribution to the Free Music Archive's collection. In addition to the Living Room Visions Summer 2012 mixtape, we've also uploaded a recent release from Ailanthus, Melillan composer Afrika Pseudobruitismus' album Waikiki Kosmos. His work to some extent matches the whole range of Living Room Visions, sound collages with buried melodies and moments of pattern that emerge from his mostly improvised compositions. Download the mixtape here. To round out our first batch of contributions, we picked Gums, the new EP and third release from Sacramento born visual artist David Mohr, who moonlights as electro-pop band FAVORS in addition to running a small imprint called Future Push. Like Living Room Visions, he is a fundamentally kind and considerate operator; humble but so talented you want to tell him to stop. Download Gums here and listen to a little below. In any event, we'll probably be adding plenty more nonsense soon. Thanks for reading and thanks for caring enough to support a site like FMA! 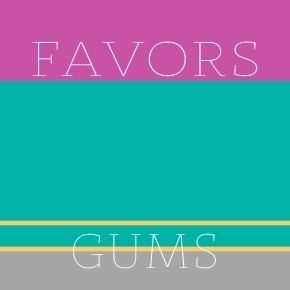 Super sweet synth-pop with a tinge of bitterness, FAVORS keeps the bubble quota high while real talkin' about social networks, WiFi hotspots, and other mundane artifacts from the digital age. FAVORS is brought to us by one of the Free Music Archive's newest curators, Decoder Magazine. They've already got a nice collection growing at their curator portal, so check out the tunes and be on the lookout for a more formal introduction in the near future.